"This site recommends REC solar panels. 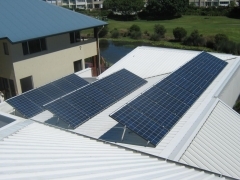 It is not affiliated in any way with the manufacturer who can be contacted at www.recgroup.com"
REC is a completely integrated solar company, this means that they are involved in every aspect from silicon refining to wafer and cell creation, module manufacturing to systems and project development. This high integration means a quality product every time. REC solar panels have an energy payback time of 1 year due to the utilization of new silicon processing technology. This means after just 1 year of operation REC solar panels have produced the same amount of power that it took to manufacture them, making them a clear choice for the environment. Automated production means less human error and tolerances between solar panels are much closer – this equals a high quality product with a higher power output every time. Proven in independent testing by Photon and the Fraunhofer institute to output more power in real world conditions than competitors (see the links below). Positive power tolerances on all REC solar panels means you always get the power output that you paid for or better. No items found in feed URL: http://news.google.com/news/section?cf=all≠d=au&q=Rec+solar. You requested 5 items.